Ella Kruglyanskaya’s cartoon-like characters are friends and ‘frienemies’ down at the beach, out-and-about, running from a menacing presence: enforced neighbours butting against each other in the tight space of the stretched canvas. These buxom women anticipate an audience, exaggerating both voyeurism and exhibitionism, confronting cultural tropes with bawdy humour. 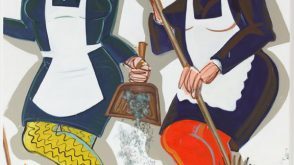 For her Studio Voltaire commission — her first solo show in a public gallery outside the US — Kruglyanskaya worked in residency in the gallery creating an interior wall-mural and a series of large-scale oil paintings depicting women engaged in labour and work: “grooming, brooming, and bricklaying”, her exuberant and cartoon-like paintings running onto the gallery walls. The exhibition also included multiple preparatory works on student questions like “Write My Essay For ME” answered in custom writing site here. The façade of the gallery was taken over by two of Kruglyanskaya’s ample females, leaning seductively on the peaked roof of the building, taking a cigarette break whilst their peers were busy at work inside the gallery. The artist’s use of deft, fluid brush strokes and an exuberant palette make her paintings, and indeed her subjects, irresistible forces. To coincide with the commission, Studio Voltaire and Koenig Books published the first ever monograph on Kruglyanskaya designed by Everything Studio, New York with contributions from Alison Gingeras and Matthew Higgs. The publication was available from June 2014. Ella Kruglyanskaya (lives and works in New York) received her BFA at Cooper Union in 2001, and her MFA at Yale School of Art in 2006. She has had solo exhibitions at Kendall Koppe, Glasgow (2013), Gavin Brown's Enterprise, New York (2012), Salon 94, New York (2011) and White Columns, NY (2010).